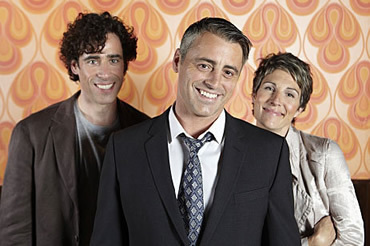 Television viewers who haven’t seen Matt LeBlanc in awhile are bit surprised to see that the actor has salt-and-pepper hair on Showtime’s Episodes. It turns out that this isn’t a new development for the actor. He started going prematurely gray while still in his 20’s, when he was shooting Friends. What do you think? Should LeBlanc have just let Joey Tribbiani go prematurely gray and skip the dying? He dyed his hair during the start of friends because premature gray hair wouldn’t have suited his joey character he used just for men men look years younger without gray hair and even with gray hair if they have a baby face he doesn’t want to dye his hair anymore he likes the silver fox look but it would be good if he could his hair again but most women think men look good with gray hair maybe he should stick with gray hair he looks 10 times better with it than without it. Personally, I think men look years younger (and better) without gray hair. Coloring Joey’s hair for the show was a good decision. Maybe he should consider using Just For Men now.